The main difference between a composting toilet and a regular flush toilet is the plumbing. Instead of using large volumes of water to transport human waste to a septic system, composting toilet systems make use of gravity—and sometimes a small amount of water—to guide waste to a compost bin or bio-chamber. Composting toilets let nature do the work. In nature, waste decomposes and the nutrients are used again by plants as fertilizer. Composting toilets do the same thing with human waste through controlled, contained biological activity. During the composting process, about 90% of the original material decomposes into water vapor, carbon dioxide and ammonia. The nutrients in the remaining compost— about 10% of the original inputs—can be put back in the natural environment. Many first-time users are happily surprised to find out there are no unpleasant odors when using a composting toilet. That is right, no more “bathroom” odors like with standard toilets! This is because a continuously running ventilation fan draws odors out of the bathroom, down a chute and into a bio-chamber, usually located in the basement. As the compost breaks down, gases are exhausted through a roof vent. Energy consumption to run the fan is between 4 and 25 watts per hour, depending on the model. 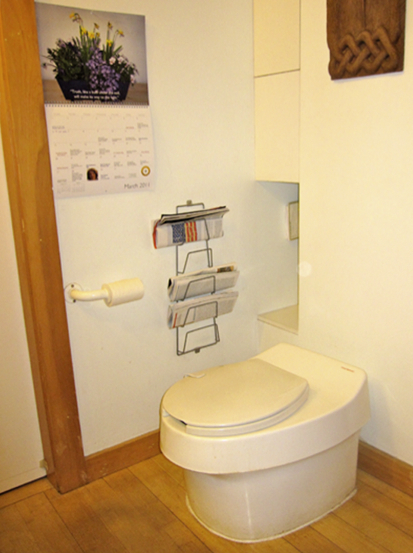 Composting toilet owners never have to plunge or deal with a toilet overflow. But they can aid the composting process by manually or automatically mixing the waste material in the bio-chamber. Heating the compost also speeds the process, and some eco-toilets include automated heaters. Heating elements increase energy usage substantially, as much as 150 watts per hour, in addition to the fan’s energy use. In most systems, it takes several years before the compost is “finished” and ready to be removed. Most systems have lower access doors or drawers, and each year a few cubic feet of compost can be removed. Some smaller self-contained systems make it necessary to remove smaller amounts about once a month. There are dozens of different toilet models on the market today. We at the Cape Cod Eco-Toilet Center have researched many of them, and offer the following information on usage and regulations to aid your decision-making process.